Summary: How Much Does it Cost to Build a House in Arizona? More specifically, how Much Does it Cost to Build a Spanish Style House in Phoenix Arizona? Spanish style homes, popular in Arizona, imitate traditional homes found in Spain. 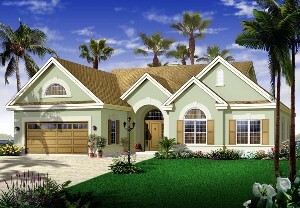 Some of the features that are found in a Spanish home are stucco exterior siding, and low-pitched barrel tiled roofs. This particular design also includes arched windows and raised entryways and most homes feature a courtyard. These homes are normally luxurious and are well appointed homes. *The living area is 1,816 square feet. *To estimate the cost to build this new home in Phoenix AZ, I will use this cost estimating software using Quality Class 4 (good standard) throughout. I arrived at an approximate total cost to build of $259,154 including a General Contractor markup of $29,586. You should keep in mind that the estimated cost to build for this example, or any house plan, can vary considerably depending on the quality of materials selected, and on actual bids for labor and material. Note: Land, land development, local government fees, impact fees, etc., are not included in any of the cost to build a house estimates on byoh.com.